No matter how advanced and multipurpose smartphones become with time, their core function will remain the same; communication and keeping in touch. Then, it also remains no hidden fact that, at least for the foreseeable future, voice calls and SMS messages are not going anywhere, either. On that note, since you’re note always looking at your phone’s screen (hardly anyone ever is), it’s imperative that the device alerts you to the presence of new items that need your attention and addressing, and for that reason, we have notifications – ringer alerts, message tones, LED flashes, vibrations et al – which let us know when our smartphone has new notifications that need to be catered to. For people who work in highly formal environments, nothing can be more embarrassing than their phone going off during a meeting, for instance. To cater to such scenarios, we have vibrations that let you know there’s something worth looking at. However, unless you take out your phone, turn the screen on and look at the notification, you cannot tell what it is about, or even who it is from. It’s quite likely that while during your meeting, you may want to skip the call from that pesky telemarketer, but at the same time, a message from your significant other might be too important to miss. Now, to solve that dilemma of not pulling your phone out of your pocket and yet be able to tell who the message or call is from, you need Vybe, if you have an Android based smartphone. 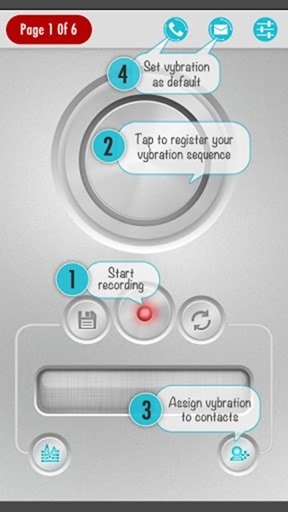 Vybe – Custom Vibrations is an app for Android that lets you define and record your own vibration patterns and then associate them with specific contacts. How it differs from other apps of its like is in the fact that you can actually record custom vibrations however you like them, without remaining restricted to a certain preset pattern. Vibrations can be associated with specific contacts in your phonebook, so five short pulses can easily reflect a call from your boss, while an S.O.S vibration pattern can indicate one from the wife (just an example here!). 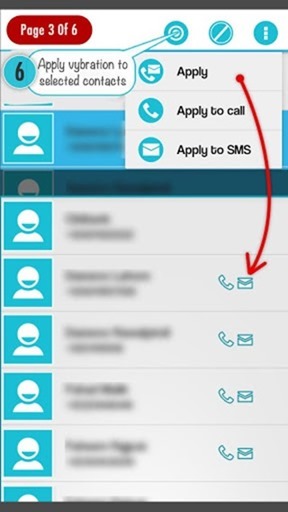 The app has the ability to take over the default vibration notifications from default SMS and Phone apps, and hence, would only serve its own version of both, should you enable it. The only beef with the current version is that while you can list down all the recorded patterns, you cannot see within Vybe which one has been assigned to whom, and hence, it’ll be more of a trial and error should you require figuring that out. Other than that, the app works as expected, and we hope future updates will address the former issue as well. Vybe – Custom Vibrations is available for free over at the Play Store, and will work with any device running Android 2.2 or above.